The CD offers a library of 73 full color illustrations in addition to those shown in the book. The CD enhances the book by extending the number of high quality images of urine sediment and blood smears that student, laboratorian or practitioner can refer to. The CD does not contain the content of the book in search and retrieval engine. This text is an essential guide to routinely performed laboratory procedures for urinalysis and hematology. It is designed for the person who is learning to, or actually performing routine Urinalysis and hematology laboratory procedures. It includes the basic information of how to collect, preserve, prepare, and examine specimens. It deals specifically with common findings in urinalysis and hematology and provides a comprehensive set of high quality images for on-the-spot reference. The book includes step-by-step procedures for both manual and automated testing of all blood components and detailed guidelines for microscopic analysis of urine sediment including crystals and casts. Care has been taken to insure that the crystal presentation is high quality in order to ease identification and a very helpful chart of these images is included. 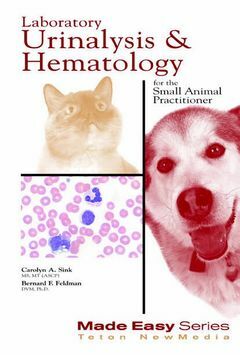 This title provides brief, precise, technical guidance for collecting, preserving, preparing and evaluation urine and blood sample in dogs and cats. Published by Teton New Media in the USA and distributed by Manson Publishing outside of North America.